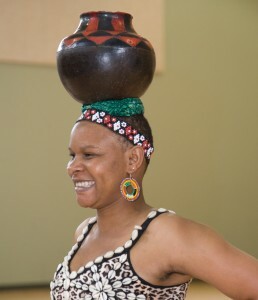 Julia Tsitsi Chigamba is a master Zimbabwean dancer, singer, instrumentalist, and choreographer. She grew up in the rich cultural traditions of Shona music and dance of Zimbabwe. The daughter of highly respected “mai Chigamba and Baba Tute Chigamba”, she is a long time member, and principal dancer, of The Mhembero Dance Troupe which performed throughout Southern Africa for over 15 years. Since 1999, Julia has perfomed and taught widely in the USA and Canada and has made Oakland her home away from home. She is the founding director of Tawanda MuChinyakare, an organization dedicated to the preservation of Shona music and dance. In Zimbabwean music and dance, the body becomes and instrument, with many rhythms danced using leg rattles. Julia’s Zimbabwean dance classes offer the whole package: culture, dance and music. Students learn the rhythms of a dance, the story and also the song that accompanies it. Julia can eventually teach students to dance while balancing baskets of seeds, or jugs of water on their heads. Under the direction of Julia Tsitsi Chigamba, the Chinyakare Ensemble boasts a collection of diverse and experienced musicians from Africa, the United States and beyond. True to its name, “deep tradition in the arts of our ancestors”, the ensemble performs traditional dance, mbira, drums, marimba, and song from Shona, and other tribal groups from around Zimbabwe in Southern Africa.